297812 Leading Stoker Arthur Blackmore RN, HMS Queen Mary. Son of James and Amelia Blackmore. Born in Pinhoe, nr. Exeter 7 March 1878. Died in the Battle of Jutland on 31 May 1916 aged 38. 203227 WT/ OP John Dodd of the Royal Naval Reserve, HM Tug Char. Son of Charles and Elizabeth Dodd of Drew Street. Born in Brixham 25 June 1885. Died 16 January 1915 aged 30. K11239 Petty Officer Stoker William Cross Fast of the Royal Navy, HMS Warrior. Son of John and Elizabeth Fast of Brixham. Born in Brixham 14 Feb 1886. Died 31 May 1916 aged 30. M12 Shipwright 2nd Class John Foot of the Royal Navy, HMS Victory. Son of Robert and Minnie; husband of Nellie Foot. Born in Horrabridge in 1892. Died 13 october 1918 aged 26. Buried in Brixham parish churchyard. Not yet confirmed - this name has not been found anywhere. 343150 Blacksmith Ernest George of the Royal Navy, HMS Indefatigable. Son of Richard and Elizabeth George (née Lewis). Born in Brixham 3 January 1879. Died 31 May 1916 aged 37. The initials may be in error. 2273C 2nd Hand John Harris of the Royal Naval Reserve, HM Trawler Borneo. Son of Nicholas Harris; husband of Alice Harris. Born in Brixham 7 August 1878, Died 18 June 1917 aged 38. J26599 Boy 1st Class George Hext of the Royal Navy, HMS Viknor. Son of Hannah Hext (w). Born in Dawlish 30 March 1897. Died 13 January when his ship was lost, aged 18. 345519 Painter 1st Class Harry Jackson of the Royal Navy, HMS Defence. Grandson of Charles and Ann Jackson of Brixham; son of Charles J. Jackson; husband of Mary Elizabeth (née Sullivan). Born in Brixham 22 September 1881. Died 31 May 1916 aged 34. M11068 Shipwright 2nd Class Robert Henry Medway of the Royal Navy, HMS Centurion. Son of William Medway of Milton Street, Brixham. Born in Brixham 13 October 1893. Died 22 January 1918 aged 25. 215925 Able Seaman Sidney George Mugford of the Royal Navy, HMS Monmouth. Husband of Emmie Mugford of Prospect Road, Brixham. Born in Paignton 21 October 1885. Died 1 November 1914 aged 29. M7003 Shipwright 2nd Class Percy Archibald Salisbury of the Royal navy HMS Defence. Son of James and Sophia Salisbury (née Welsh) of 6 Warren St., Keyham, Devonport; husband of Bessie Salisbury (née Snell). Born in Plymouth 25 May 1888. Died 31 May 1916 aged 28. M6750 Shipwright 2nd Class William Henry Sanders of the Royal Navy, HMS Clan McNaughton. Husband of Tryphena Sanders of King Street, Brixham. Born in Brixham 4 May 1889. Died 3 February 1915 aged 26. Able Seaman John Browning Smale of the Royal Navy, HMS Asphodel. Son of John Smale of Okehampton. Born in Brixham 16 March 1897. Died of natural causes 5 October 1918 aged 21. Believed to be J 64364 Alfred Stanley Stevens of the RN, HMS Tiger who was born in St Aubyn, Devonport 27 June 1901. He was injured in the Battle of Jutland, in May 1916 when Tiger was attacked, eventually dying of his wounds 9 March 1920 at the age of 19. 1997C Seaman John M P Tribble of the Royal Naval reserve, HM Drifter, Active III. Son of John Tribble; husband of Emma Tribble of Mill Slip. Born in Kingswear 13 March 1877. Died 15 October 1917 aged 38. 202718 Ships Corporal Thomas Westlake of the Royal Navy, HMS Bellona. Son of George Westlake of Milton Road, Brixham. Born in Brixham 13 May 1883. Died of natural causes 30 November 1914 aged 31. Buried in the old Burial Ground, Brixham. 150805 Able Seaman/Leading Boatman ( Coast Guards) Frank Woodley. Husband of Mary Ann Woodley of Scarborough Born in Brixham 16 September 1873. Died 25 April 1915 aged 42. A 5799 Seaman Charles Leam Bridge of the RNR, SS Cliftondale. Son of Charles and Mary Bridge of Victoria Road, Brixham. Born in Brixham in the March Quarter of 1893. Died 25 December 1917 aged 24 when Cliftondale was sunk by a submarine. B4482 Seaman Thomas Lakeman Bulley of the RNR, SS Laurentic. Husband of Annie Bulley of Higher Street, Brixham. Born in Brixham 10 January 1898.Died 25 January 1917 when SS Laurentic was sunk. 3945B Seaman Harry Dyer of the Royal Naval Reserve. Son of William and Sarah Dyer of Brixham; husband of Mina Dyer (née Brewer). Born in Brixham in the September Quarter of 1884. Died 25 January 1917 aged 33. 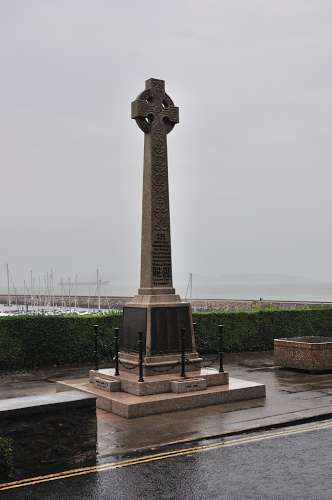 Also commemorated at Milford Haven. London Z 3219 Signalman Thomas Elliott ("Tom") of the RNR ,SS Samia. Parents not known. Born in Brixham in the June Quarter of 1887. Died 12 September 1918 aged 31 when boarding steamer Samia was sunk by submarine U65. B 4055 Seaman Frederick James Gardener of the RNR, HMS Ocean. Son of Eliza Gardener and the late James Gardener. Born in Brixham in the June Quarter of 1887. Died 4 March 1915 aged 28 at Gallipoli. A 7835 Seaman Frederick German of the RNR, HM Trawler St. Elvies. Son of Henry German of Temperance Place, Brixham. Born in Brixham in the March Quarter of 1899. Died 11 October 1915 of illness, aged 16..
C 3085 Leading Seaman John Lloyd Jones Gifford. of the RNR, SS Potomac. Son of Henry and Lary Gifford of King Street, Brixham. Born in Brixham in the June Quarter of 1884. Died 16 February 1917 aged 33, after a collision. 12402 Private Samuel John Jordan of the RMLI, SS Devenetia. Son of William and Sarah Ann Jordan. Born in Littlehempston, nr. Totnes, 9 July 1884. Died in the UK 18 October 1916 aged 32. Ply/2057/5 Private William Henry Martin of the 1st Reserve Battalion, the RMLI. Son of the late Edwin and Eliza Martin. Born in Torquay in 1889. Died through disease 24 September 1918 aged 29 at Aldershot. A 6552 Seaman Harry Medway of the RNR, SS Saltee. Son of Susan and William (his father was also lost at sea). Born in Brixham in 1893.Died through illness 30 October 1918 aged 25. B4672 Seaman John H Moore of the RNR, HMS Goliath. husband of Mary Moore of North View Road, Brixham. Born in Brixham in 1875. Died 9 August 1915 aged 40 when his ship was lost. B 3128 Seaman Henry Rackley of the RNR, HMS Europa. Son of George Rackley and the late Annie; husband of Polly of King Street. Born in Brixham 10 May 1884.Died through illness 22 July 1915 aged 31. Buried in Malta. 2661C Seaman (William) Francis Thomas of the RNVR, HMS Vivid (shore establishment). Husband of Alice Thomas of Glenmore Terrace. Born in Brixham 21 August 1882. Died through illness 25 November 1915 aged 33. Buried in Brixham's non-conformist cemetery.